When I found sour cherries at the farmer’s market, I couldn’t believe it! They’re rare beauties! I knew I needed to get them and had to bake with them before it was too late! One of my worst fears is buying the prettiest produce and then saving it too long for the perfect recipe and ending up wasting them. It’s just super-rude of me when that happens. I haven’t made a cobbler in awhile, and I love them! They’re like biscuits, fruit, and awesome all in one. I baked up half of it in this mini skillet (I kinda imagine it’s my little dog, Elliot’s skillet. I mean, it’s his size, ya know? What am I saying?) And divided up two more portions in ramekins. These little rubies of the fruit world baked up a tart and sweet dream. 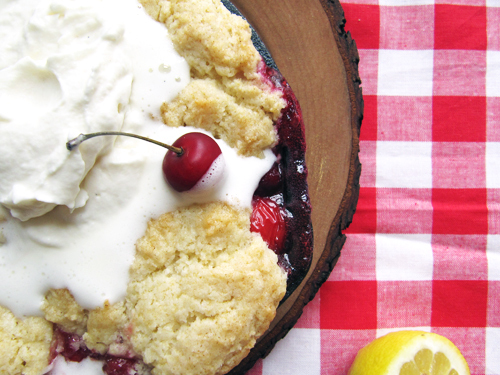 I want to have cobbler for breakfast every day, ya know? And since it’s biscuit-y, it should probably happen. Preheat your oven to 350F. Combine cherries, cornstarch, sugar, lemon zest, and juice in a small saucepan. Heat until boiling, turn off heat. Transfer cherry mixture to one large cast iron skillet (or 8-9 inch baking pan) or for single servings, 4-6 oven safe ramekins. Meanwhile, stir together the flour, baking powder, salt, and sugar. Cut the butter into the dry ingredients using a pastry blender or your fingertips until it resembles crumbs. Add milk a tablespoon at a time and stir gently until a soft dough forms. Dollop the dough over the cherries and bake in a 350F oven for 30-45 minutes or until the biscuit is lightly browned and the cherry filling is bubbling. Serve with vanilla whipped cream. For a printable pdf of the recipe click HERE. I used a small piping tip to pit these guys. Worked like a dream! 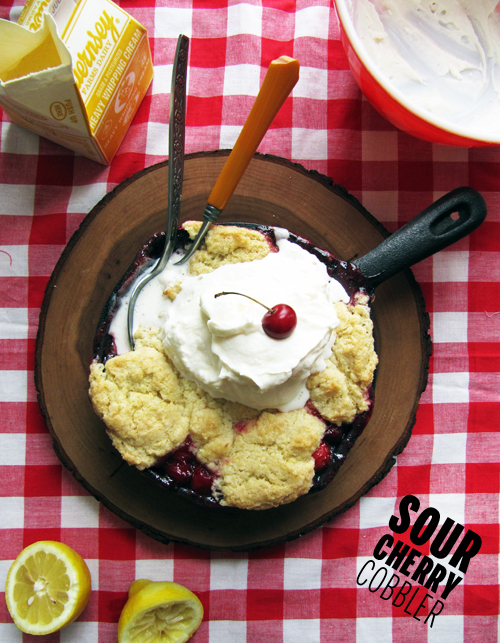 Oh now I love me some sour cherries.. and this cobbler is the straight up Cherry Bomb! GEMS! I’m so glad you found some and this cobbler could totes be breakfast/pre-lunch! Yeah! Me too! I hope your little market gets them soon! P.S. I didn’t have the energy for a crumobbler. Next time. Sour cherries! How I do adore Michigan. This cobbler looks lovely and I think I’ll have to check out my local farmer’s market to see if I can find some of these jewels. Michigan is so thoughtful when it comes to produce, man! I hope you find them! Pre-lunch sour cherry cobbler? HIGH FIVES for that. Prettiest cobbler of all time! Go Guernsey! Did you see that I got my hands on some sour cherries, too?? Where have they been ALL MY LIFE??!! Ah! Yes! I can’t wait to see what you make with them! You know I would just not leave the house and have that for breakfast lunch and dinner. I’ve been craving a cobbler like crazy!! You need to get yo cobbler on, dude! Ohh girl I’m about to go up north in WI and I will be getting some of these sweet cherries!! I’ve been just waiting to get my hands on some sour cherries, too. Heading to the Royal Oak Farmer’s market tomorrow morning in hopes they’ll have some! Yay! 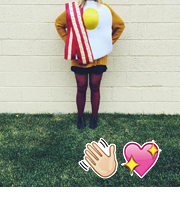 I just perused your blog and we both live in Ferndale! Totally neighbz! 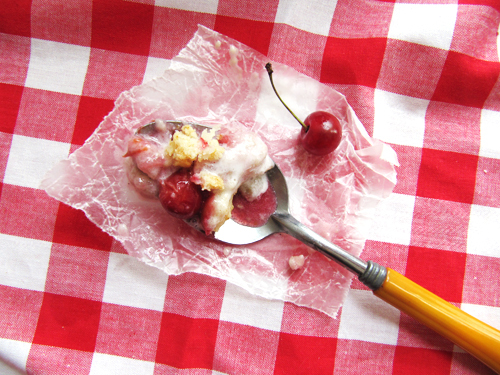 What a genius way to pit cherries!! Thanks, Lauren! It made pitting a breeze! At what market did you find the cherries? I can never find sour cherries at the farmers market. You made a great dessert with them! Eastern Market in Detroit! Thanks, Laura. I am a new cherry lover and this is looking way too good! Must make! Thanks, Tieghan! I’m new to cherry-love too! 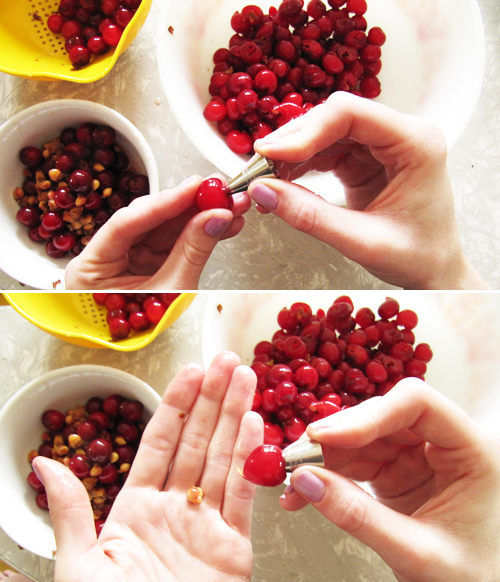 Such a smart trick for pitting cherries! This dessert looks amazing. This recipe/these pictures are blowing my mind. I have never had a sour cherry. Not in a pie, not Ina cobbler. It’s a tragedy. Thanks, Sarah! You need to sour cherry it up soon, fo realz. Your piping tip trick is BLOWING MY MIND. I recently chanced upon your blog (best thing to happen to me!) 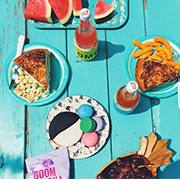 I’m like totally in love with your insane recipes,styling and entertaining posts. So I made this divine cherry cobbler for dessert tonight and I’m shamelessly admitting to devouring it to the last drop!(almost!) Can’t wait to try more of your swoon-worthy recipes!